The U.S. Supreme Court ruled Thursday that a sweeping ban on handguns in the nation's capital violated the Second Amendment right to bear arms. 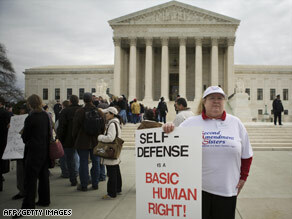 A gun ownership supporter holds a placard in March outside the Supreme Court in Washington. The justices voted 5-4 against the ban, with Justice Antonin Scalia writing the opinion for the majority. At issue in District of Columbia v. Heller was whether Washington's ban violated the right to "keep and bear arms" by preventing individuals -- as opposed to state militias -- from having guns in their homes. With the gun culture in schools and all.. do you think its right?